On 25 December 2004 my husband Karl and I made our way on ferry across gleaming waters to the paradise of Langkawi Island in Malaysia. Christmas on honeymoon, on one of the most glorious islands of the world! 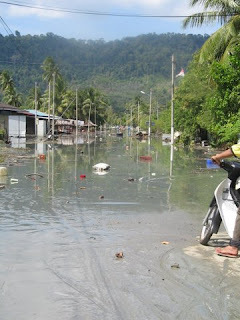 Little did we know that a mere 24 hours later the world would look so different for so many when an earthquake hit Sumatra and sent shockwaves in the form of very disturbed waters, in fact a frightening tsunami rushing towards the coastlines of many nations. We went for a morning walk after breakfast on the morning of the 26 December, to find a great recession of water and wandered around looking for shells thinking this was some peculiar island low tide phenomenon. In the bliss of honeymoon, I found myself totally forgetting the advice of a former geography teacher - to always run in the opposite direction when you see a strange pulling back of the tides. Then the waves started coming in again from the right and swirling around toward the left, turning over a jet-ski and surging under a yacht that managed somehow to stay afloat. It was then that we decided to rent a motorbike, to move onto higher terrain and away from the uncertain waters. We rented a bike and headed off, but Karl stopped along the way to see if we could dry off a poor drenched kitten affected by the first set of waves. 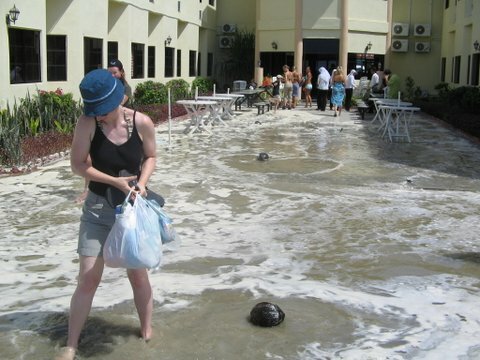 Then Karl panned the video camera around and we saw a dark wave of water headed towards us. And we could see it was not going to stop at the shore. But we could not see the ignition which was tucked out of sight as the hotel had started it for us! So Karl and I ran a short distance up a curved bridge and watched as the water surged over the road, and under the bridge upriver, like a river in flood, but in the wrong direction. We realised we would have been stuck in the water if we had not stopped by the side of the road. 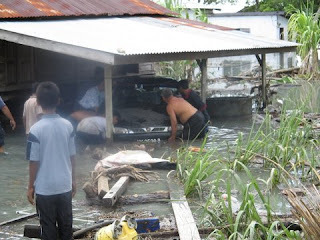 And then the sight of the muddy homes filled with water, the wrecked cars and damaged property. But no loss of life that we knew of on Langkawi Island. Little did we know that a couple hundred kilometres north of us in Thailand, people by the thousands were losing their lives. The local paper showed the rising toll of deaths, but we remained strangely numb to the reality of the facts. It was only when we came back home and watched footage my Dad had recorded for us that the tears began to flow. When Christmas time comes with such tragedy, it reminds me of the reeling shock of recent world events, so close to the celebration of our Saviour’s birth. This can throw us into confusion and dismay. We don’t know how to process the horror of such uncontrollable events. But the light that shines so brightly through the coming of Jesus to earth, who was willing to suffer unimaginable pain for us and carry the sufferings of the world, outweighs the greatest turmoil and puts us into a place of perspective once again. The question is, how do we shine the light of hope into a world disorientated by such uncertainty? How do we shine this light into so many great and diverse needs? Friends of ours, Don and Margie Cook, began an organisation called Hands on Houses (www.handsonhouses.com) to build homes for the very poor, widows and disabled people in coastal villages of South India. They have been there for 8 ½ years and have built 131 houses with a small team of 4 and then 12 local men. Margie and Don are planning on starting Hands on Houses in Malawi too, hopefully in 2016, and are currently waiting on donations to make this a possibility. The inspiration of this couple shows me how it is possible to take the light of Christ and make it a reality to so many in need of light. How Jesus causes resurrection and rebirth to take place through ordinary people like you and me, so that other ordinary people can experience these miracles too. People whose lives turn around by acts of mercy, acts of kindness. Widows and disabled people who have never heard of the love of Jesus, now see it demonstrated through hands of love and action that bring them a new hope for life and a complete turnabout of destiny. But how do we see the afflicted in our own neighbourhoods? When we can’t be with people who have been affected by these disasters around the world in a physical way, we can look to see the people God places in our day to day life and shine our light of hope and possibility, right here and now - in our churches, our workplaces, our families, our communities. And we can listen for the prompting of the Holy Spirit about where to reach out with the loving action of God’s compassionate grace. Our church is neighbours with a township called Vrygrond, a community of many mostly African nations all gathered into one place. Some other inspiring friends of ours, Anton and Elana Cuyler, left England where they had been living for some time, and came back to their homeland trusting that God would show them what to do when they got here. They felt to come to Muizenberg, and were led to the Bay Community church. Incrementally over the past number of years, God has opened door after door and led them step by step to reach into the Vrygrond community with hope, love and empowering action. http://thesozofoundation.org.za/our-story/. The miracle of the Sozo Foundation is bringing hope to people with often fewer options in life, opening doors of education, home improvement, vegetable gardening, and training young people in skills that can create job opportunities for them. These beautiful people inspire me with hope once again. I see how it is possible to take one small step into your field of influence and beyond into the corners of the world, and lean the light of Christ into places of great need. To start seeing lights lit up all over the place as we join spirit with the many people all over the world who also have a heart to see the miracle of transforming love overcome the darkness. 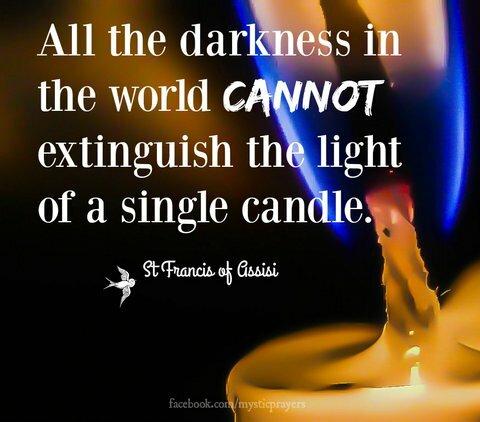 We agree with the heart of St Francis, that yes, the darkness cannot extinguish the light of even one small candle. And when we light the flame of love, we will find around us the lights of many flames and the flames when they burn together will show that love wins out over chaos and tragedy every time. Take some time to meditate on the Hope of the world - how nothing takes God by surprise and how the light will always outshine the darkness in our own hearts and lives and into the furthest reaches of the world. How God reorients our hearts to His compass of peace and gives us a God-view of events. As we intercede for the people of this world, we will not underestimate the power of our prayers, these humble prayers. When we are rooted and established in Christ, we are moved to do what God calls us to do and be who he calls us to be at such a time as this. We take hope in the coming of Christ. Again and again, He comes into the heart of the world’s greatest need. And we know that rebirth and resurrection are miracles He will continue to alight in the hearts and lives of people, as He reminds us of the miracles of His birth, death, and resurrection. Nothing can separate us from the love of God that is in Christ Jesus our Lord. And so we know and rely on the love of God.